A report presented at the Association for Professionals in Infection Control and Epidemiology (APIC) Annual Conference in 2013 referenced studies that found 15 percent of flexible gastrointestinal endoscopes used for patient screening contained unacceptable amounts of bacteria. While several factors could result in the improper cleaning of endoscope equipment, including human error and inappropriate use of cleaning chemicals, one major problem could be not using a twisted wire brush, which is critical in proper cleaning. Sanderson MacLeod employs first-piece, in-process, and final-piece inspection for all products, and we staff highly trained quality inspectors 24 hours a day. Sanderson MacLeod produces industry-leading, world-class twisted wire endoscope cleaning and duodenoscope cleaning brushes that provide distinct features not found in other brushes. As a large-quantity contract manufacturer for endoscope cleaning OEMs, we have worked diligently with our customers to reach beyond the demands of the marketplace. One advancement is the option of using polypropylene fibers in our endoscope cleaning, duodenoscope cleaning, cytology, and interdental brushes. Polypropylene fiber is a thermoplastic polymer, which is extremely durable and resistant to many chemical solvents. It is softer and gentler than traditional nylon fiber. Polypropylene fibers are available in all standard diameters and a wide variety of colors. Our polypropylene fiber medical brushes are available for all medical applications. All medical brush products use FDA-approved materials and are individually documented to ensure regulatory compliance. Both nylon and polypropylene brushes come standard with antimicrobial fibers. The largest risk for endoscope and duodenoscope damage can occur during cleaning with a brush that is inserted into the equipment. Traditional brush tips can fall off, sharp core wires can protrude from the tip, and the tips can bend and break. We solved these problems by looking outside of the brush industry and collaborating with experts in materials joining engineering. We conducted hundreds of hours of research, trials, and testing to create a new manufacturing process that uses high-energy, fusion-welding technologies. The result is an entirely new protective brush tip that melts the brush’s preconstructed core wire into a consistent, smooth, and inseparable protective tip, known as the Z-Tip. The most important aspect of the Z-Tip is that it will not create microscopic scars while cleaning endoscope equipment. By not creating scars that trap contaminants, the Z-Tip promotes endoscope sterility. 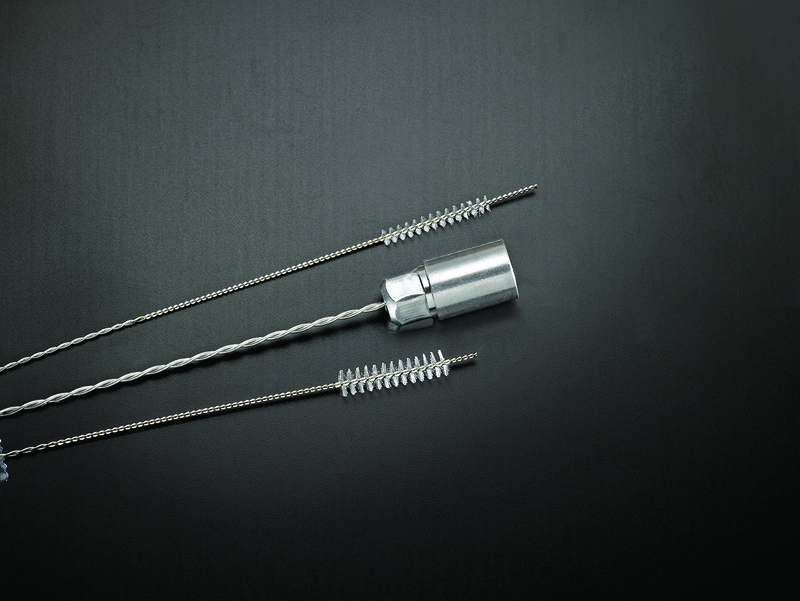 The Z-Tip is available for all commonly used twisted wire medical brush applications. The twisted wire brush designers and engineers at Sanderson MacLeod continually pursue ways to perfect the medical brush. Their efforts have resulted in countless improvements and innovations. In 2013 Sanderson MacLeod introduced a proprietary method of making stylets for cleaning endoscopes up to 125 centimeters long. To remain cost-competitive, we design and build our own manufacturing equipment, allowing us to offer products that are unparalleled in quality and unlike any other manufacturer.